It’s retro, it’s kitschy, it’s cool…but most of all, it’s socially responsible. Meet the DA8288 Eco Can; this season’s most talked about new product. When this product was launched in September 2012, it was met with an incredible response. 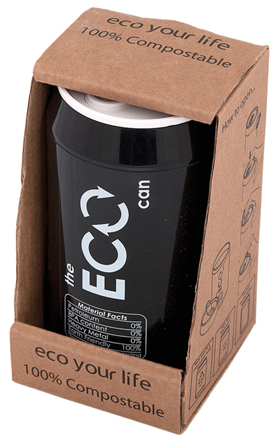 Buyers from across the country flocked to see the Eco Can! Let’s learn more about what makes this product so special. While it may resemble a tradition pop can, the Eco Can couldn’t be more different. It is produced using Polylactic acid (PLA), which is a thermoplastic aliphatic polyester derived from renewable resources, such as corn starch. Products made from PLA are BPA free, non-toxic, and its CO2 emissions (during manufacturing) are significantly less than those from petroleum based plastic. But most importantly, PLA is compostable, which means that it starts to biodegrade within 20 – 50 days after planting it in acidic soil. As an effective drinkware solution, the Eco Can is an ideal choice to transport juice, soda, water, and other cool or warm beverages. Additionally, it will easily accommodate food items like soup and oatmeal. No matter how you put it to use, the Eco Can is a great food and beverage accessory. 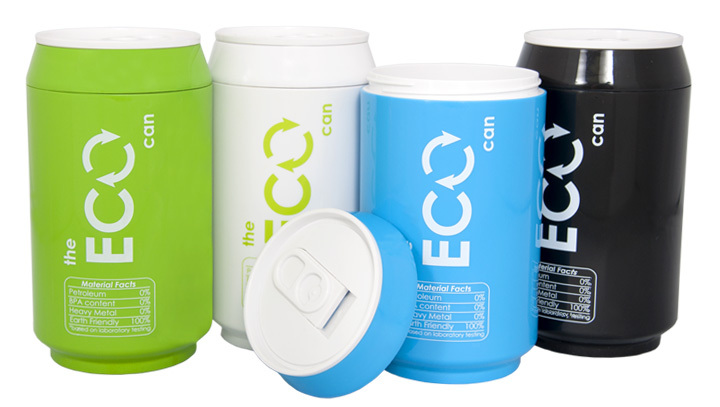 Keep in mind that the Eco Can is microwave and dishwasher safe, making reheating and cleaning a snap! Uniquely packaged as illustrated. Includes instructions on use. There is an unlimited number of applications for this product. But to get your creative juices flowing, we’ve put together a few ideas. Why not launch an incentive program that rewards eco-conscious behaviour in the office? Give an Eco Can to each employee to start the initiative off on the right foot! Similarly, you may want to use the Eco Can in lieu of disposable cups at upcoming events or incorporate the Eco Can as a gift with purchase. Aligning your name with eco-friendly products, like the Eco Can, is a great way to express an identity that is innovative, forward thinking, and socially responsible. 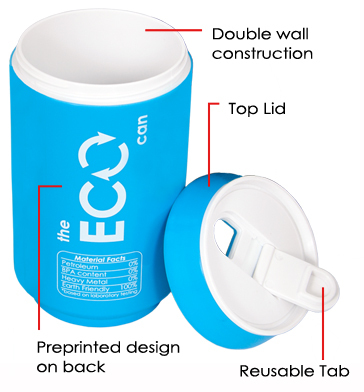 As an added benefit, the Eco Can’s eye-catching appearance will garner additional attention that will act to enhance your brand recognition and advertising impressions. This entry was posted in Drinkware, Eco-Friendly Products, New Product Announcement and tagged Biodegradable, BPA Free, corn starch, Drinkware, Eco-Conscious, Eco-Friendly, PLA Plastic, Reusable Water Bottle, Socially Responsible, Swag, Water Bottle by Debco. Bookmark the permalink. I am no longer in the business but if I were I’d sell this for sure!! Love it!!!! Thanks Wendy! It really is a fantastic product. There are so many creative ways to use it too!